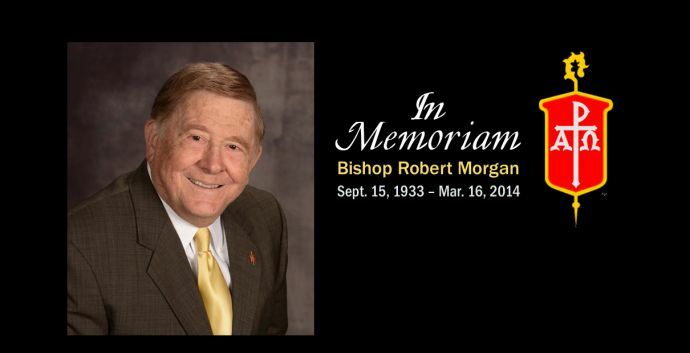 Retired United Methodist Bishop Robert “Bob” C. Morgan, who twice oversaw the merger of annual (regional) conferences and mentored a number of active bishops, passed away Sunday, March 16. He was 80. “I always refer to him as a ‘leader of leaders,’” said Bishop Lindsey Davis, who served as a district superintendent under Morgan and considers him a mentor and friend. Davis now leads the Kentucky Annual and Red Bird Missionary conferences. Visitation will precede the funeral from 9 a.m. to 11 a.m. CT.
Davis in a remembrance counted five other bishopswho served under Morgan before being elected to the episcopacy. Even bishops who never served directly under Morgan shared how much they valued his guidance. Willimon, who is now a professor at United Methodist-related Duke Divinity School and pastor of Duke Memorial United Methodist Church in Durham, N.C., said Morgan also never lost sight of the God he served. Morgan, who began his ministry in Alabama, was elected a bishop by the Southeastern Jurisdiction in 1984. He first served as bishop for eight years in Mississippi, where he oversaw the merger of two conferences into one statewide conference in 1988. He next served as bishop in Kentucky from 1992 to his retirement in 2000. There, he also oversaw the merger of the Louisville and Kentucky conferences in 1996. Bishop Bill McAlilly, who now leads the Tennessee and Memphis conferences, served under Morgan in Mississippi and said the late bishop also cast a vision for planting new churches. They included a new church development to which Morgan appointed McAlilly in 1986. McAlilly walked into the conference office with a bunch of reasons why he should not move. That gift for appointing clergy stood Morgan in good stead in merging conferences, said Bishop James E. Swanson Sr., who now leads the Mississippi Conference. As part of the merger, Morgan made appointments of clergy without regard for which conference they had historically served. “It really created a sense of oneness,” Swanson said. To celebrate the merger’s 25th anniversary, Swanson invited Morgan to speak at the 2013 Mississippi Annual Conference. Swanson credited Morgan with helping people to see and work toward the greater good, rather than focusing on their individual fears and desires. Morgan was born Sept. 15, 1933, in Birmingham, Ala., and he died there in his home on Sunday morning. He was educated in Birmingham Public School and graduated from United Methodist-relatedBirmingham-Southern College. He earned his master of divinity from Candler School of Theology at United Methodist-related Emory University before returning as a pastor to the North Alabama Conference. Davis noted that Morgan’s leadership skills gained recognition early, and he was appointed a superintendent of the Tuscaloosa District when still in his mid-30s. He was the senior pastor of Vestavia Hills United Methodist Church in Birmingham, when he was elected bishop. As bishop, he was a member of the United Methodist boards of Discipleship and Global Ministry. Morgan was president on the United Methodist Board of Church and Society from 1988 to 1992. Morgan also was president of the Council of Bishops from 1999 to 2000. After his retirement as an active bishop in 2000, Morgan became bishop-in-residence and a religion instructor at his alma mater, Birmingham-Southern College — a position he held until his death. After Morgan joined the faculty, the number of students bound for seminary increased, and his courses regularly attracted more students than there were seats. Thirteen of his recent students are now studying at United Methodist seminaries. She added that Morgan had a talent for recognizing other people’s gifts, even if they did not see it themselves. Lora Parker, one of Birmingham-Southern’s recent graduates, attested on Facebook to Morgan’s effect on her own sense of calling. “’Bishop’ is the one who looked me dead in the eye as a sophomore and told me, ‘Lora, you’re supposed to be in ministry,’” said Parker, who is now the youth director at First United Methodist Church in Oxford, Ala., and director of summer programs at Sumatanga, the North Alabama Conference's camp. Morgan is survived by his wife and ministry partner of more than 50 years, Martha; four children and eight grandchildren. "Bishop Morgan has shown remarkable leadership to the church across the years,” said a statement by Bishop Debra Wallace-Padgett, who now leads the North Alabama Conference and served under Morgan in Kentucky. She will be among the speakers at his funeral. “He will be sorely missed by the North Alabama Conference, the Council of Bishops and the church as a whole."